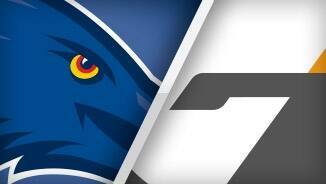 Full Time and the Crows have notched up their second win on the trot with an emphatic showing of forwardline strength which has seen the Giants put to the sword to the turn of 65 points.. BEHIND CROWSJacobs can't quite add his name to the tally sheet for the afternoon as his hard lead and impressive mark in front sees him spraying his shot across the face from 40m out..
GOAL CROWSNot to be outdone, the Crows shift it down to ground level from the bounce before Jenkins fires clear of any opponent, blazes to the 50m arc and bangs it home with authority..
GOAL GIANTSMajors don't come much easier as Shaw and Reilly collide in defence which sees the ball spill to Cameron who strolls into an open goal-square before passing to Patton from point blank. With the result beyond doubt it's time for the Crows to put in their contenders for Mark of the Year as Podsiadly, Douglas and Jenkins all launch for the same ball but take each other at halfforward. GOAL CROWSPodsiadly with the trailing run as he brings the ball to ground where Betts fires out an overhead handball to Douglas who curls it home from inside the right forward pocket. Sharp chance. GWS can be well pleased with their endeavour this term as they've taken the game up to the Crows and can be pleased with their workrate up front. Crows have done the damage early; their lead is 58. Giants InterchangeAdam Treloar off due to an injury. 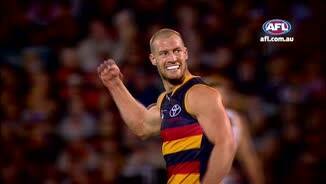 Crows InterchangeKyle Hartigan off due to an injury. Welcome to Adelaide Oval for the Adelaide Crows v GWS Giants Round 5 clash. 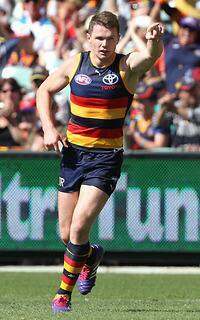 DYNAMIC Patrick Dangerfield kicked five goals in Adelaide's 65-point trouncing of Greater Western Sydney in Sunday's match at Adelaide Oval. 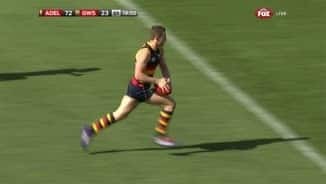 Dangerfield, whose early season form had been ordinary by his high standards, booted four goals before half-time as Adelaide logged their second win of the season 21.11 (137) to 10.12 (72) in front of 44,770 spectators. 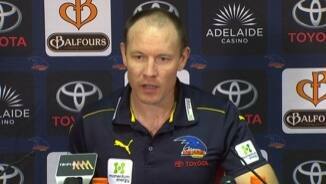 Crows coach Brenton Sanderson said the home side's victory honoured 250-game milestone player Scott Thompson. "We did focus on doing our very best to put in a good result for Scotty Thompson, who's been one of our very best players in the club's short history," he said. "For him, great to chair him off at the end. "Those mids were fired up today; they love Scotty Thompson and they weren't going to let this game slip today." 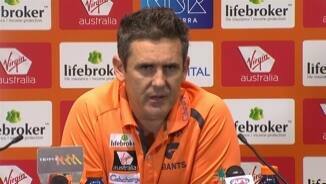 Giants coach Leon Cameron said it was then a tough ask for such young and inexperienced players to lead a comeback. "For [Ward] to go down half way through the second and then you rely on a five-gamer or a seven-gamer or a 31-game player to actually try to pick us up off the canvas," he said. "It's tough for them, but we've got to learn from it." 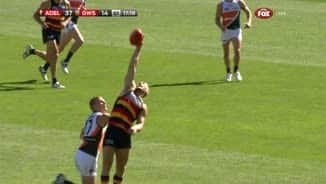 Adelaide was inspired by Dangerfield's brilliance and Scott Thompson, who celebrated his milestone with another prolific ball-winning display. Dangerfield (33 disposals), Thompson (38), ruckman Sam Jacobs, backman Matthew Jaensch (29) and impressive third-gamer Matt Crouch (28 touches until he was subbed at three-quarter time) were influential, while Josh Jenkins kicked four goals and Matthew Wright three. The Giants, without their prime mover Ward, were overwhelmed in the midfield, although Stephen Coniglio (29 disposals) and Toby Greene (28) battled gamely against the tide. 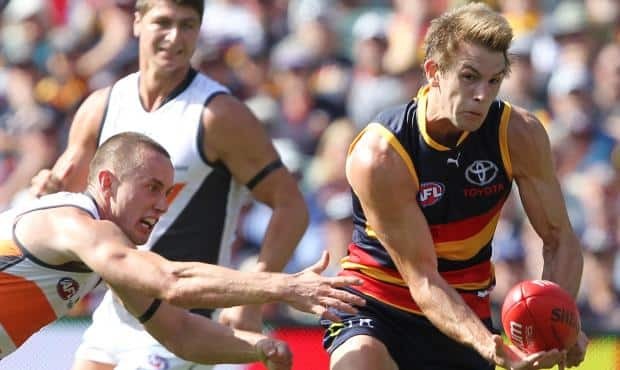 The Giants were up and about early, and for the first half of the opening term were in control of the match, but once the Crows established ascendancy late in the first quarter they struggled to remain in the contest. The Giants' prized top draft pick Tom Boyd was barely sighted on debut. He had just five disposals and didn't score, but had plenty of similarly quiet teammates.